The Internet has made it easier and more affordable than ever to make money online from the comfort of your home. While online opportunities aren’t your only way to earn income, they are usually more flexible than other options. In many cases you can work anytime and anywhere, as long as you have Internet access. Further, depending on your goals, you don’t necessarily need to invest anything but your time to get started. 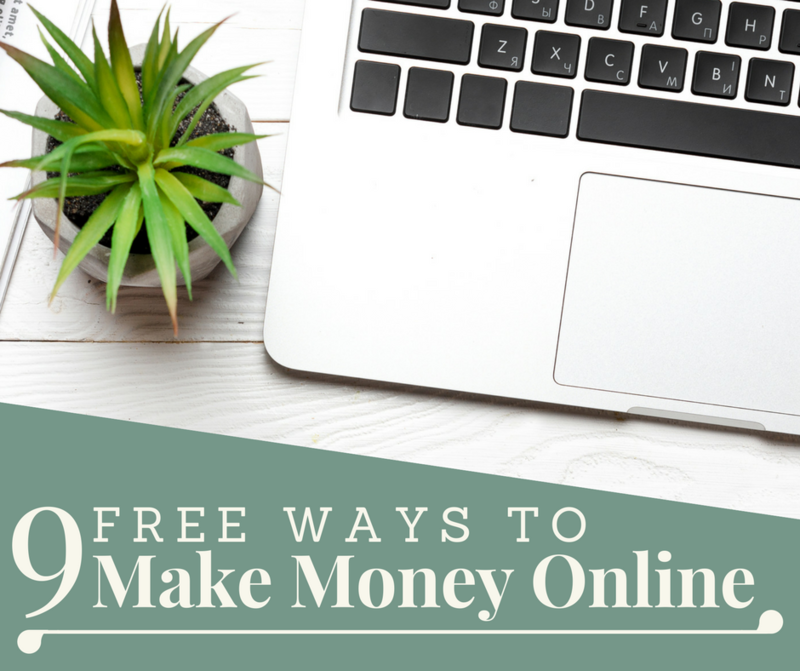 Here are free ways you can get started making money online for free. All work-at-home jobs and freelance work are free or they’re not legitimate jobs. That doesn’t mean you won’t be required to invest in software or equipment needed to do a job. For example, a transcription job might require that you have a foot pedal. A customer service job might require a quality headset. However, when it comes to getting hired to a job, there shouldn’t be any fees (except maybe paying for a background check). Any company that charges to make sure you’re serious about the job or to set up up on its system, isn’t really a job. Further, while a job might require that you have special training or equipment, a legitimate employer won’t sell their own products to you. For example, if company A says that in order for you to work for it, you have to buy its special software and pay for training, that should be suspicious. But if company B says, you need to own a copy of Quickbooks that you can get from anywhere you want and attend a free training, that would be okay. The biggest challenge to getting a job or freelance work to make money online is finding the jobs and getting hired. It’s important to understand that work-at-home jobs aren’t any different from traditional jobs. You need skills and experience the employer wants, and you need to go through a hiring process that includes a resume or application, and possibly an interview. The same is true for freelance work. So it’s important to give up the idea that you can simply sign up to type at home. WAHS post jobs regularly on the WAHS Job Board and sends them in the weekly emails. Upwork (formally Odesk and Elance) is good resource for finding freelance work. Fiverr is another. Another option is microworking which involves freelance short-tasks. To learn more, check out WAHS’s article How to Make Money with Surveys. The most success affiliate marketers I know have a WordPress blog and email list to make money online, both of which require some monetary investment. However, you can start out with free options, such as Weebly (if you use it’s subdomain ie yourname.weebly.com), and then when your income grows, invest in the tools that will allow you to increase your income. There are a couple of ways to make money online with affiliate marketing, but the most popular and successful are a blog and/or email list. Even if you just opt for an email list, you’ll need a landing page from which to gather email addresses. There are several free blogging platforms, such as Blogger, which is owned by Google which makes it easy to incorporate other Google tools, such as the AdSense feed (to make money). The best type of blog for making money are information and/or “how I did it” blogs (i.e. how I got out of debt or how I lost 100 pounds). One of the nice things about starting a blog, is that there are a host of other income options besides affiliate marketing. Success in blogging comes from having lots of people read it, which means you need to market your blog. Another great tool for generating affiliate sales is the email list. Every online business should have an email list with a free offer to lure them to sign up. MailChimp offers free email service to the first 2,000 subscribers and 12,000 emails (each subscriber counts as an email. If you have 2,000 subscribers, that means you can send only 6 emails…6 X 2,000=12,000). Once you know how you’re going to attract and stay in touch with readers, you need to add affiliate programs to your site. Affiliate programs are free to join, and simply require that you sign up and add code to your site where you want ads to appear. Some programs will want you to meet certain thresholds (i.e. 500k traffic) before accepting you into their program. Further, you want to pick products and services that are quality and reliable, and that fit with the topic of your blog and/or email list. Another option to make affiliate income that I’ve begun using more is a simple funnel/email system. In this case, you don’t have a built a blog and keep it updated with new content. Instead, you create a lead capture page and use email to share tips, information, and affiliate offers. Learn more by checking out WAHS’s Affiliate 101 article. To learn about how to build a profitable affiliate income through a funnel system, grab the Affiliate Funnel Success Planner for free. Do you have unwanted items around the house? Why not sell them? There are many places you can sell your unused and unwanted items, including trash like paper towel rolls. Ebay is the most well-known place for selling your used items. Amazon is a great place to sell used-books and other items. Check out this article on getting started with Amazon Fulfillment Selling. Etsy is the place to sell your home-made goods. But did you know that Esty crafters need affordable materials such as wine corks and toilet paper rolls? If you have a cell phone or if you’re a digital photographer by hobby (or career), you can sell your photos to make money online. The need for photos online is huge. Bloggers, ebook publishers, videographers and more need photos for their content and promotional materials. There are many great places online where you can sell your photos. For more information, check out this article on How to Sell Your Photos Online, that includes a list of resources you can sell on. If you have a smartphone and/or a computer, you probably already have what you need to make videos. If not, phone apps and software to edit video is very affordable. I have Pinnacle Studio 19 Ultimate, which includes screen capture as well as video editing that was less than $65 (Pinnacle has lower cost editing software as well). There are several ways to make money online through video. One would be to post on YouTube and sign up for monetization (now YouTube requires 1000 subscribers and 4000 hours viewed to qualify for its ad revenue). When people watch your video and click on an ad, you can earn money. You can promote affiliate products in your video by doing a review or testing them and including a link to the product in your description. Speaking of Teachable, it along with other online course platforms such as Udemy, have free options to set up your own course and make money online. If you know how to do anything, odds are you have a topic you can teach online. It can be something from your hobby, volunteer experience or work. For example, do you know how to play the ukulele? You can teach it online. Do you you know to live frugally? You can teach it online. Do you know how do car maintenance that will save money on mechanic bills? You can teach it online. Read my article at The Balance on How to Make Money with Online Courses. Don’t want to create a course? Why not write down what you know into a how-to book? Or write that great American novel you’ve been talking about. Ideally, there are a few expenses you should invest in when publishing a book, such as editing and cover design. However, publishing your book on Amazon, Barnes and Noble, and iBooks is free. Check out Digital Writer Success: How to Make a Living Blogging, Freelance Writing, and Publishing Online. There are many apps now that let you earn money in many of the same ways you can online, such as surveys and microtasks. However there are a few other unique ways to make money through apps too, such as testing apps. Finally, apps can help you keep more of your money through a variety of savings and rebates programs. Combine these options together, and you can definitely have several hundred dollars more at the end of each month. Have you found a free way to make money online? Let us know in the comments below!